Give Beets a Chance: Planting, Growing, and Harvesting Beets! Beets, the word alone makes a lot of people shudder with disgust. According to a survey from Eating Well, beets are listed as one of the most hated vegetable along with Brussel sprouts, okra, and lima beans. But we want to build a case on why you should add beets to both your garden and diet. Beets are a hassle-free vegetable to grow! They’re high in vitamin C, fiber, and antioxidants. Beets are versatile and can be added to smoothies, salads, and desserts. Try this chocolate beet cake recipe! Beets are easy to grow and tastier than you think. Beets prefer cold temperatures, so start to grow them early spring or late summer when the temperatures start to cool. Till the area to really loosen the soil; beets grow better in soil that has been well worked. Before you begin planting you also want to add compost to your garden, to ensure your soil has the proper nutrition. 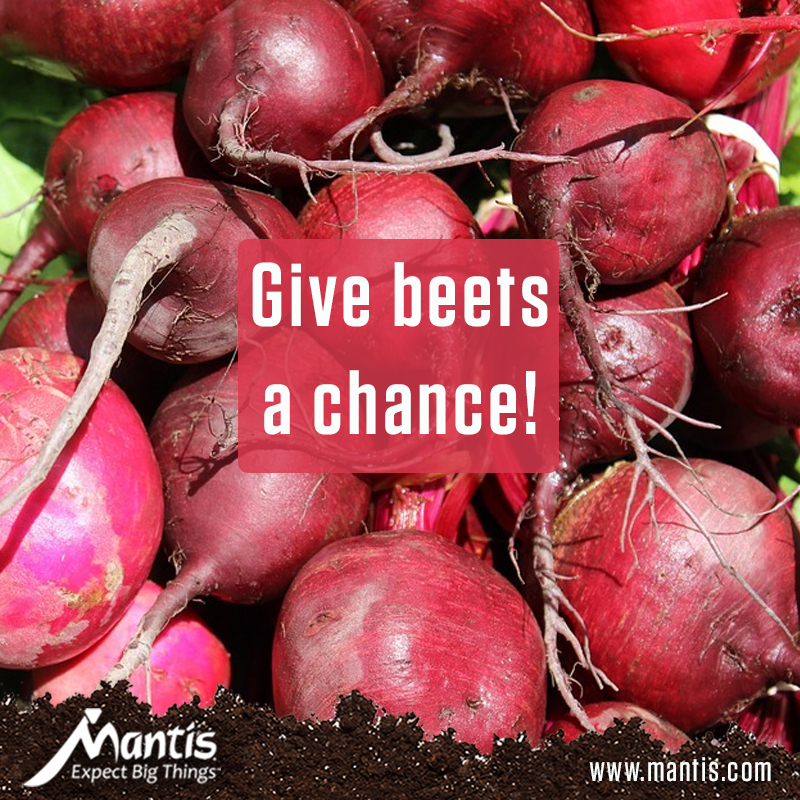 Keep in mind, beets thrive in soil with a high phosphorus level. Before planting your seeds, make sure the soil is properly watered. Take the additional step of soaking the seeds for a few hours for faster germination. Plant the beets ½ inch deep and 1-2 inches apart, in rows that are 12 inches apart. Gently cover the seeds with soil and lightly water the seeds. It’s critical to thin out the seedlings once they start to grow so they are not too close together. Beets that are close together will not produce bulbs. Thin the plants so each beet is about 5 inches apart. Make sure you keep the soil moist and add mulch around the plants to help maintain moisture; beets use a lot of water when they’re forming. Depending on the variety, beets should be available to harvest 50-70 days after planting. When the diameter of the roots reach 1-3 inches, you know your beets are ready to be picked. Your beets should be deep in color and medium in size. Smaller beets tend to taste better while larger beets tend to have a woodier taste. Water the ground a few days before harvest to loosen up the soil. You can also dig around the beets for an easier pull. Don’t forget the beet leaves; they’re perfect for juicing or salads! Once pulled, beets generally last 5-7 days, so make sure you know how you’re going to use them. Beets can be steamed, pickled, juiced, or used in dessert recipes for an added sweetness! I LOVED your article on Beets! Such detail! Great. Answered all my questions. I will definitely be giving beets a try this fall. Please start a series (with the same degree of detailed instructions.) It instills confidence in success. Hi Katherine! Thank you so much for the kind comment. Yes, we will continue this series! Let us know what vegetable you would like use to cover next!! I was not the biggest fan of beets for a long time. While at a state fair I attended a cooking class where the cook took a medium size beet, spiralized it into noodles, and added a sweet salad dressing. The beets were not cooked and I loved them, as did my family This is the simplistic and best recipe! I’m not a fan of beets either, but this cake changed my mind. It’s really moist and you can’t taste the beets. I love my Mantis. But here in SW Florida I have sandy soil in my garden. How can I amend the soil to start a garden?